It’s not burdensome to buy an item with bitcoin. A retailer rings up an order and presents the buyer with a QR code. The purchaser scans the code with his or her phone, taps a few buttons to confirm the purchase — and voila — a bitcoin purchase. However, mobile payments are experiencing a renaissance, thanks to Apple Pay and even the retailers’ competing CurrentC, and suddenly a few extra clicks is a few too many. Atlanta-based bitcoin payments processor BitPay plans to announce during the Money 20/20 conference its new Bitcoin Checkout app, a point-of-sale app that brings one-tap payments to cryptocurrency. The Bitcoin Checkout app works with every bitcoin wallet on any device — users can scan the QR code and be done in a few clicks. However, the NFC functionality that enables the one-touch payment is only available for Android devices. Gallippi said only three wallets that they’ve tested so far work with NFC: Mycelium, Bitcoin Wallet and Hive. However, Gallippi guessed that some bitcoin wallet apps have not turned on their NFC compatibility yet and said he expects the number to go up. While the iPhone 6 does have NFC, Apple locked it down so it can only support Apple Pay. And while some large chains may be turning off their NFC devices in preparation for their own mobile payments system launch, those are likely not the same stores who would be using the Bitcoin Checkout app, explained Gallippi. BitPay’s current app was designed at first to onboard smaller retailers, not for a larger company with hundreds of employees. 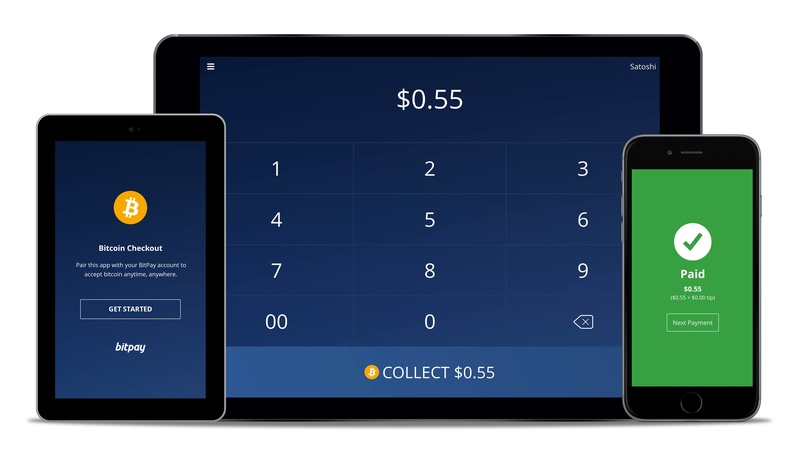 BitPay’s new Bitcoin Checkout App allows for one-touch payments via NFC. Part of the new app is adding support for the service industry. It can support multiple employee logins and tipping, even issuing a tip report so managers can know how much money to dole out at the end of the night and to whom. While the app and payment processing itself is free, BitPay’s new “freemium” model means retailers can add extra support like Quickbooks integration. As apps like Apple Pay and Google Wallet make consumers more comfortable tapping their phones to buy a hamburger, it’s no surprise that BitPay wants to make retailers cozy with the idea too. Will the purchasers know their Bitcoin conversion rate at the time of purchase? Otherwise they may end up paying more or less than they thought.